The following diagram depicts Yosai's architecture. Note that only one Realm is provided with yosai.core but others are shown to illustrate support for multiple realms (and their respective AccountStore). A Subject represents state and security operations for a single application user. These operations include authentication (login/logout), authorization (access control), and session access. A subject is Yosai's primary mechanism for single-user security functionality. A SecurityManager executes ALL security operations for ALL Subjects (aka users) across a single application. The interface itself primarily exists as a convenience - it extends the Authenticator, Authorizer, and SessionManager interfaces, thereby consolidating these behaviors into a single point of reference. For most Yosai usages, this simplifies configuration and tends to be a more convenient approach than referencing Authenticator, Authorizer, and SessionManager instances individually. Instead, one only needs to interact with a single SecurityManager instance. In addition to the above three interfaces, this interface provides a number of methods supporting the behavior of Subject(s). A Subject executes authentication, authorization, and session operations for a single user, and as such can only be managed by A SecurityManager that is aware of all three functions. The three parent interfaces on the other hand do not 'know' about Subject(s) so as to ensure a clean separation of concerns. An Authenticator performs authentication for any given Subject (aka 'application user'). It uses an authentication strategy to coordinate authentication among one or more realms configured for authentication. An Authorizer performs authorization (access control) operations for any given Subject (aka 'application user'). It coordinates authorization requests among one or more realms configured for authorization. 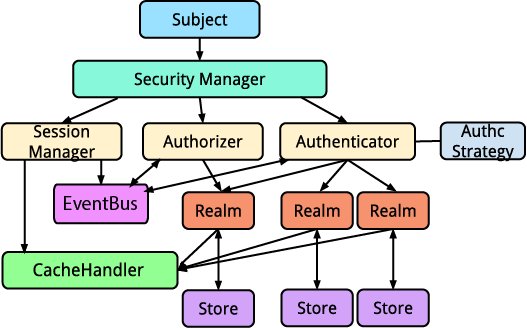 A Realm access application-specific security entities such as accounts, roles, and permissions to perform authentication and authorization operations. Realms usually have a 1-to-1 relationship with an AccountStore, such as a NoSQL or relational database, file system, or other similar resource. However, since most Realm implementations are nearly identical, except for the account query logic, a default realm implementation, AccountStoreRealm, is provided, allowing you to configure it with the data API-specific AccountStore instance. Because most account stores usually contain Subject information such as usernames and passwords, a Realm can act as a pluggable authentication module in a PAM configuration . This allows a Realm to perform both authentication and authorization duties for a single account store, catering to most application needs. If for some reason you don't want your Realm implementation to participate in authentication, override the supports(authc_token) method to always return False. Because every application is different, security data such as users and roles can be represented in any number of ways. Yosai tries to maintain a non-intrusive development philosophy whenever possible -- it does not require you to implement or extend any User, Group or Role interfaces or classes. Instead, Yosai allows applications to implement this interface to access environment-specific account stores and data model objects. The implementation can then be plugged in to the application's Yosai configuration. This modular technique abstracts away any environment/modeling details and allows Yosai to be deployed in practically any application environment. Most users will not implement this Realm interface directly, but will instead use an AccountStoreRealm instance configured with an underlying AccountStore. This setup implies that there is an AccountStoreRealm instance per AccountStore that the application needs to access. Yosai introduces two Realm interfaces in order to separate authentication and authorization responsibilities. A Store is a data repository. Yosai uses an AccountStore, specifically. An AccountStore contains Account information, such as credentials, roles, and permissions. A CacheHandler provides an abstraction on top of an underlying caching mechanism, such as yosai_dpcache, managing key generation and cache region interactions. An Eventbus can publish events to event subscribers as well as provide a mechanism for registering and unregistering event subscribers. An event bus enables a publish/subscribe paradigm within Yosai -- components can publish or consume events they find relevant without needing to be tightly coupled to other components.